We have a lot of posts with dead links and abandoned mods. So many good mods got deliberately removed because of superceded or something. depends what the mandatory bug fixes are. 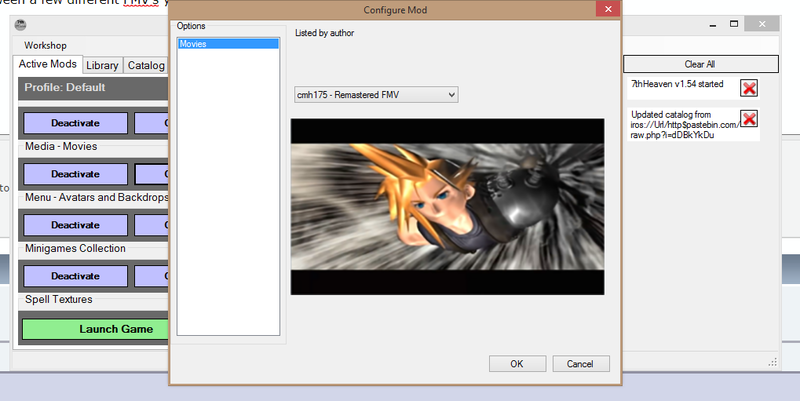 I am hoping this will be compatible with 7th heaven as well as that tool has proven brilliant, in memory hacking so on disk install not trashed and easy to merge various mods. Whatever 60fps is in 7th heaven that seems to work almost perfect, I have only noticed minor glitches with it. syntax of address, I checked the documentation supplied, it says 00s at start dont need to be present, but just in case I did try with them present but it made no difference. if I run using the supplied testfile it functions as expected however. It doesnt tell me more then that. I can confirm the tifa addresses are file, the original post where they documented specifically says to hexedit the file, and I can confirm if I edit the file manually it has the desired affect. So unless you can confirm I have done something wrong to me it looks like a bug, in which case I am posting in the right thread. yeah so I can do things like swap out what the game displays as a potion in the mini game screen for say a counter materia. Its something. This solution would show the original prize on the race screen, but the new prize on the results dialogue. Am I been an idiot hextedit is always saying 0 changes made which I Can confirm with a hexeditor. 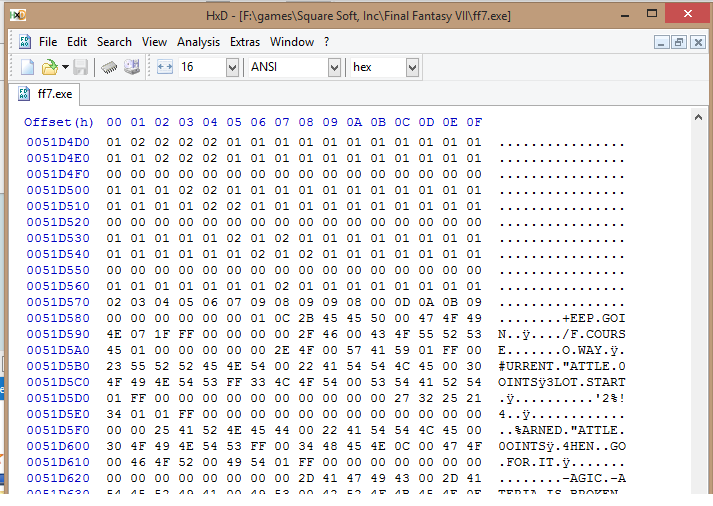 Here is my txt file which I am trying to use to change all tifa's misses to hit and make vincents ultimate weapon ramp up quicker. 7thHeaven / Re: trying to update 7th heaven to v1.55 is it? Can you at least disclose if this is still dependent on the new reunion and new threat or is now independent? Features you have said will be in 1.56 I consider critical for what I am trying to do now in the game (hext), if it looks like its more than a few days away I will need to try and find another solution. This all looks very nice, it appeared back when you posted that several months ago it was all complete or nearly complete and its just delayed artificially waiting for DPLB to release his new mods?, or you guys still working on it? Also this post to say its not "officially" launched yet. Suggesting there is a working version which some people have access to. thanks, this line is correct for HEXT_in? Can you provide info on Scene-look-up please? the google cache of this page shows a link to wiki here which explains it but seems it got pulled? Is there any documentation to this, or did people just start fiddling and eventually work out how it works? I am interested in editing the possible chocobo prizes for the chocobo races, and also the enemy spawn chances for battles. ok thank you, I will try to find that tool and look for what you said. I think I am in the right place, loads of reference to labels and some text about accepting GP, but I dont know what to edit, and what the labels are referencing, do you have an idea a way to match the labels to specific prizes? Ok I found you can expand the tree, which shows more of what is going on, but I think this script is after the race has done, not the script that runs on the chocobo selection screen pre race? The thing that will stop me donating for now DLPB is you seem to be pulling projects. The download link is dead, you requested it to be closed, but the replacement is not yet available so you have effectively removed the option. I hope you reconsider your decision and at least wait until the replacement project is available. I had a bad experience on another forum where I donated 100s of dollars to different developers who would pull their work a short time later. Is it possible or one already exists? In my balance mod, I have the precious watch and chocobracelet modified so they increase AP growth, so I have an armour with 4 triple grow slots, and one with 8 double grow slots. These are rare, but I think they too rare, they can only appear as the rare prize and that prize very rarely spawns on a 1-2 result. I want to remove stuff like potion as a prize from S class, and make it so either the rare prizes only rotate between a few items, or allow these 2 armours to appear as more common prizes.